Families with children who have been harmed by the epilepsy drug sodium valproate are demanding a public inquiry and compensation, saying they have been left with no help. They voiced their anger outside a London hearing that is assessing if warnings for patients are adequate. It is thought thousands of children in the UK have been left with disabilities caused by valproate since the 1970s. Mum Emma Friedmann says she wasn't fully informed of the risks. Her son, Andrew, 18, has severe autism and other problems including hearing and sight problems. Emma was taking the drug when she got pregnant and carried on using it. "I wasn't properly told about all the risks," says the 46-year-old from Leicester. "Andrew now needs full-time care, 24/7. Families like me need justice. We want a public inquiry and compensation." Carol Lapidge, 50, from London, whose daughter, Nicola, 31, has learning difficulties, says: "The care has not been there. I've had to fight for physiotherapy, speech and language therapy and occupational therapy. There has not been enough help for Nicola." 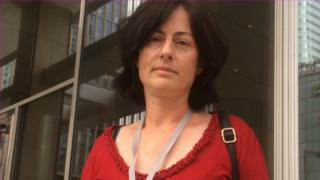 Susan Cole, 53, from London, whose daughter Hannah, 17, has learning difficulties, says many women have similar stories with some "horrific" cases where women have been "left with nothing". "The dads have left, they have no money and have been unable to work. "There are also the miscarriages and stillbirths. We don't know how many of them there have been. But there's been no help and no investigation into what went wrong - why there was not more warnings, why doctors have not been clearer about the risks." The drug, known as Epilim, is used to control seizures. It carries a 10% risk of physical abnormalities and a 40% risk of autism, low IQ and learning disabilities. Valproate is an effective treatment for epilepsy, bipolar disorders and migraine - and doctors prescribe it because it is the best option for some women. Instructions for doctors - and, more recently, patient leaflets - say valproate should not be used during pregnancy unless there is no safer alternative and only after a careful discussion of the risks. Sodium valproate has been prescribed since the 1970s, but it was only last year that additional warnings were put on the outside of packets under a new regulatory system. The European Medicines Agency review in London is hearing testimonies from families, experts and the drug's makers Sanofi. Sanofi has said it will review the data on the risk-minimisation measures currently in place, but has argued valproate helps patients avoid potentially fatal seizures. Speaking at the EMA public hearing, Eric Teo, who is responsible for drug safety at Sanofi, said he "sincerely empathises" with the families affected. He acknowledged there were increased risks of physical and cognitive problems with using valproate during pregnancy. But he said patients and doctors needed to balance the risks and benefits as pregnancy was a "huge challenge" for women with epilepsy who rely on the drug. He said the firm had "always provided the most up-to-date scientific information". And he added: "Everyone in the health care system has a role to play to ensure risks and benefits are properly understood." Medicines watchdog the MHRA says the decision to use any medicine in pregnancy requires a careful evaluation of the benefits and risks to both the woman and to her unborn child. It says that the safety of valproate in pregnancy has been kept under constant review, and as new data have become available, the warnings have been updated. In France, 1,200 families are preparing to sue Sanofi, accusing it of failing to sufficiently inform women of the risks. The French government is supporting the legal action and has put aside about £9m to compensate the families. In 2010, families in England and Wales had to abandon a court case when their legal aid was withdrawn three weeks before the case was due to begin. They signed letters promising never to sue again and, in return, were not billed for Sanofi's multi-million pound legal costs. The EMA will report on the review's findings by end of the year.